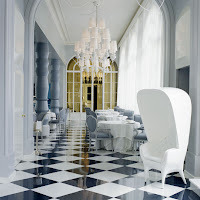 I often admire the furniture designs of Jaime Hayon. I once considered purchasing a few of the Showtime Armchair with Cover pictured above, but after discovering it would cost me $5,000 - $10,000 for one, I soon disregarded the thought. Jaime, PLEASE make some 1:12 editions of that chair! I appreciate the classics with a modern twist designs that you often see showcased in Metropolitan Home Magazine. I’ve never decorated my home in this flavor but have been considering revamping some miniature displays to reflect this appreciation. 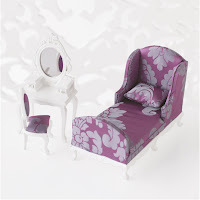 Aside: Would love to find some mirrored furniture in 1:12, but will probably be forced to create it myself. 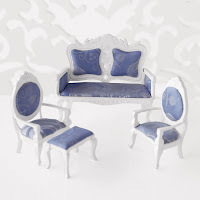 Brocade is currently offering some miniatures that I’m considering for purchase to utilize in some of these “modern meets classic” displays. 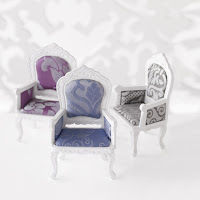 The miniature sets are $49 for one set and $89 for any two sets with free shipping. 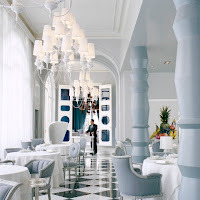 I’ve been thinking about using the miniature chairs offered by Brocade to pseudo recreate the look of Hayon’s La Terraza del Casino restaurant design pictured above.